Alf had a greater influence on Victorian walking than anyone in the history of the sport He was a school-mate of Frank O'Rourke in Melbourne and joined the Victorian Walkers Club in 1923, two years after its formation. He soon began to mix administration with his walking and took up the positions of Club Secretary and Handicapper in 1927. Thus began a career of 50 years of service to the Victorian Amateur Walking Club. His stint as Secretary lasted till 1932 (6 years) and his position as club handicapper lasted till 1955 (26 years). In 1937, he took on the position of club President, a position he then kept until 1973 – a period of 38 years. His great capacity for work saw him assisting in the startup of women's athletics in 1929. He marked the grounds and filled in as timekeeper, starter and equipment officer. It was at this time that he met Mabel Moad, then Australian Walking Champion and hard worker for the VWAAA. Mabel, along with Dot Mulcahy, formed a women's section of VAWC and thus was started a long partnership which eventually saw Alf and Mabel marry and work together in furthering athletics in Australia. VAWC was eventually closed down during the Second World War when Alf, along with so many others, enlisted. He became commander of a platoon training corps, an appropriate ranking for someone of Alf’s toughness and organisational abilities. During his time in the army, he organised many Track and Field meetings for the troops. After his return from active service, he returned to his position as President of the club and took on the responsibility of reorganising the club and guiding its continuing development over the next 30 years. He became more involved with VAAA administration but still found time at the club level to do most of the admin work, organise the races, time and organise the lapsheets and manage Victorian Teams for Australian Championships. He was part of the Road Events Committee for the 1956 Olympics (along with Bert Gardiner) and was appointed Manager of Road Events for that most prestigious of events. In 1959, he became Secretary of VAAA and worked in that capacity for 12 years. He was a one man show but everything was done and the whole organisation ran smoothly. His work as Victoria’s delegate to the AAU for 9 years helped Victoria greatly. In 1962, he was elected as Athletics Manager of the Perth Commonwealth Games team. But all during this period of frantic activity, he remained the driving force behind the desire for clubrooms of our own and, when eventually opened in 1963, they were named after him – The Alf Robinson Hall. He had been one of the many tradesman who had rolled up the sleeves and actually built it brick by brick. But his efforts did not slow. There was always something to be done. By 1967, VAAA had expanded to become a 7 man executive with each in charge of a portfolio. Alf took on the Competition Manager Portfolio (Summer and Winter), the toughest job of the lot. In 1968 and 1972, he was Sir Edgar Tanner’s full time secretary with regard to Olympic Games and he did a wonderful job in helping to organise the Australian Teams for both these Olympics. In the early seventies, the traffic flow around the Albert Park roads had increased and he spent many an afternoon with the Albert Park Trust working to ensure that our road racing courses remained viable and safe. He did not restrict his walking endeavours exclusively to VAWC. In an effort to develop walking in Australia on a national level, he was instrumental in the foundation of the Australian Federation of Race Walking Clubs and served as President for a record 20 years until Peter Waddell was elected in 1973. He was eventually awarded a Life Membership of VAAA for his outstanding services to the state organisation. Alf and his wife Mabel (also a VRWC life member) were a wonderful combination. Mabel was a fitting female counterpart to Alf. 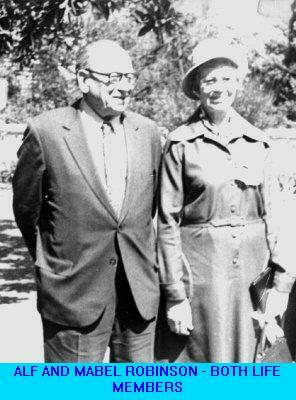 Just as Alf was the defining force behind male athletic development in Victoria, Mabel was the force behind women's Athletics in Victoria. Mabel was also made a life member of the club and her great contribution to the sport of walking is discussed separately. His ability in timekeeping was phenomenal. He was the only man in Australia capable of taking 4 place times in 100 yards. When short of officials, he could laptime 30 walkers as they raced around a 440 yard track. Arriving at Melbourne Post Office at 8.55 PM yesterday, A. E. Robinson, the Victorian long distance race walker, completed his walk from Sydney to Melbourne in the record time of 12 days, 13 hours, 45 minutes and covered 563 miles. The previous best time was 13 days 6 hours. Robinson, who was accompanied throughout the journey by J. Watts, a masseur, who rode a bicycle, said that he felt quite fresh but was badly in need of a good meal. "After I have a good meal", he said, "I intend to go to bed and remain there all day tomorrow." Yesterday, on the last stage of his walk, Robinson came from Tallarook, 55 miles from Melbourne. He had intended to reach Kilmore on Sunday evening, but blinding rain had forced him to stop at Tallarook at 7 PM. He left there yesterday at 4.15 AM. Often he had been forced, he said, to complete a day's stage on nothing else but dry biscuits, and heavy drenching rain and bleak winds had brought on cramp incessantly. Robinson will compete in the 50 km walk at the Showgrounds on Saturday week. He intends to make a further attempt at the distance in 10 days. 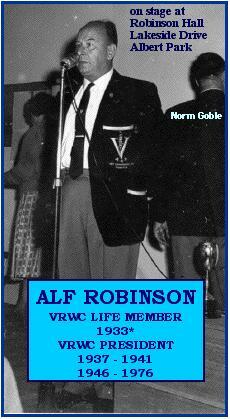 The Alf Robinson Memorial Trophy is awarded annually to the winner of the VRWC Open 20 km Men's Championship.